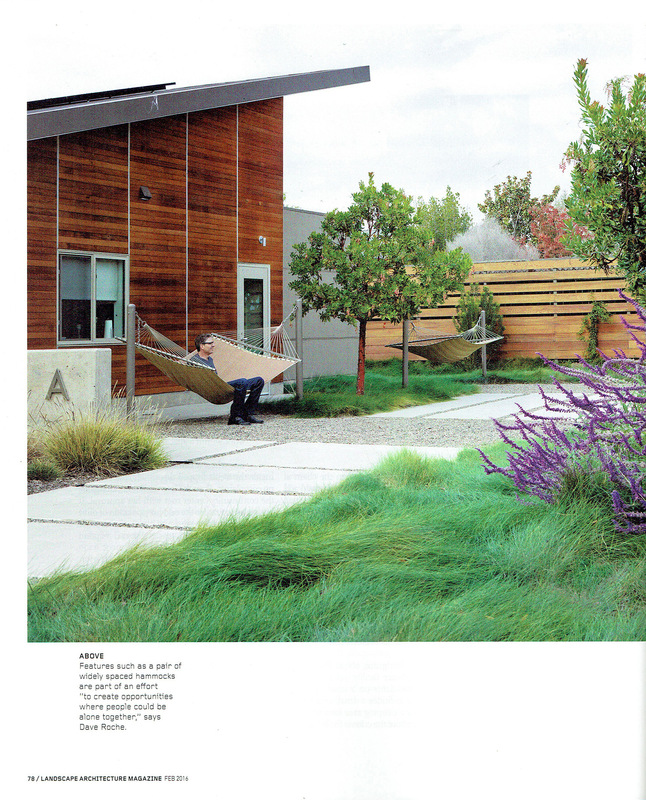 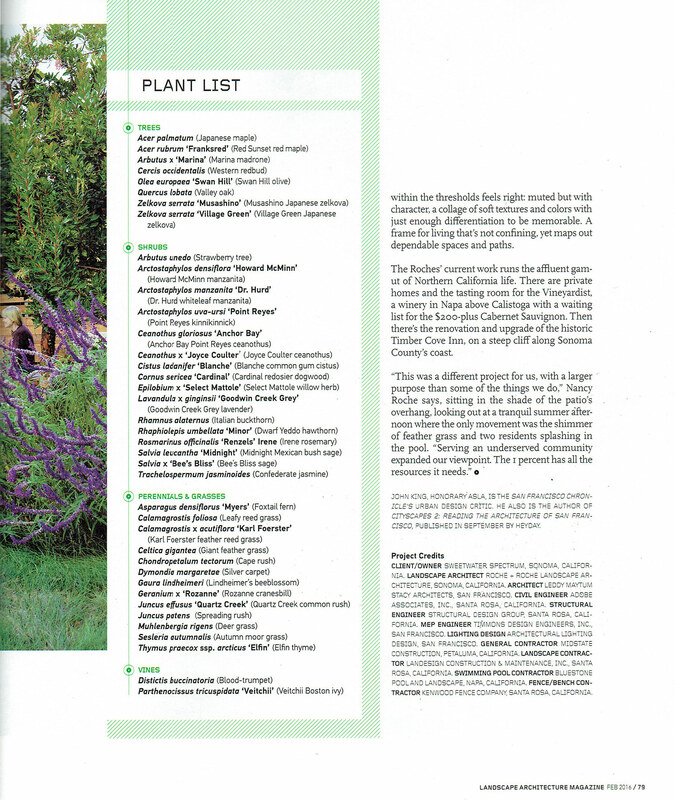 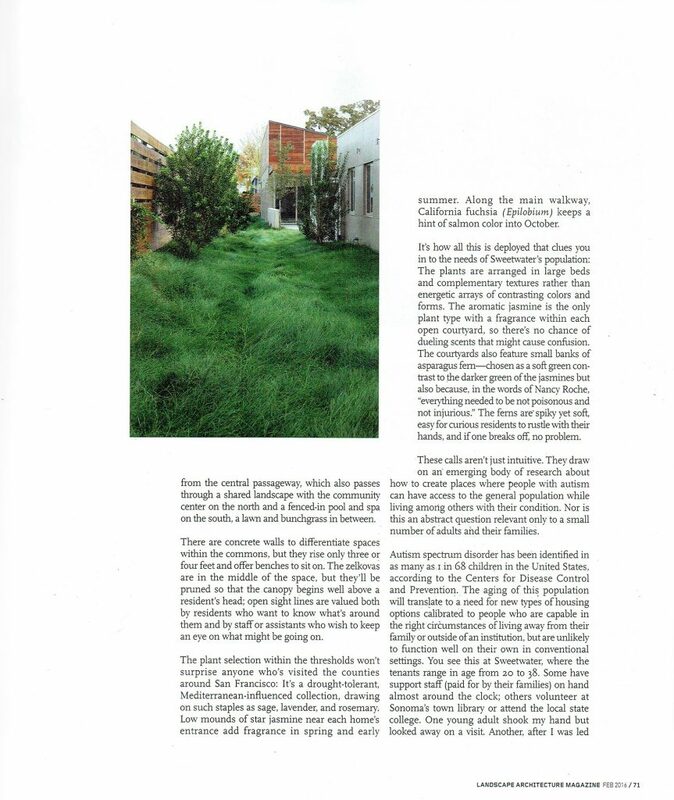 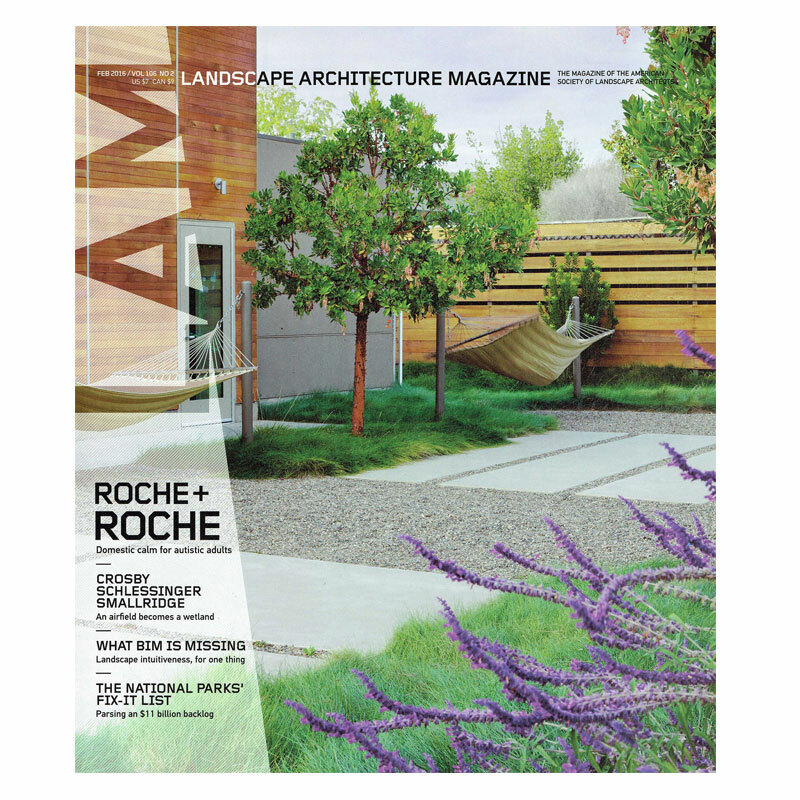 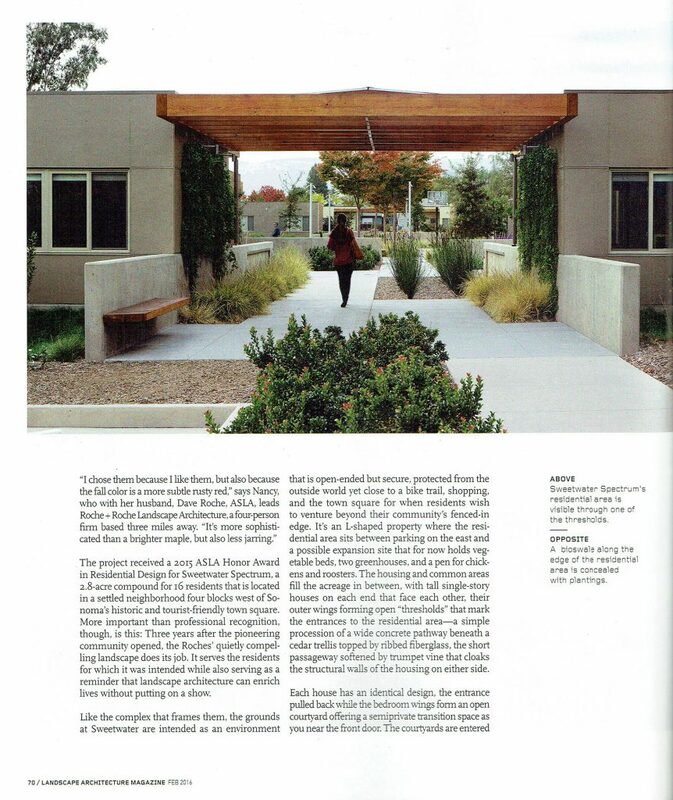 The February 2016 issue of Landscape Architecture Magazine featured ROCHE+ROCHE Landscape Architecture’s design for Sweetwater Spectrum Residential Community for Adults with Autism. 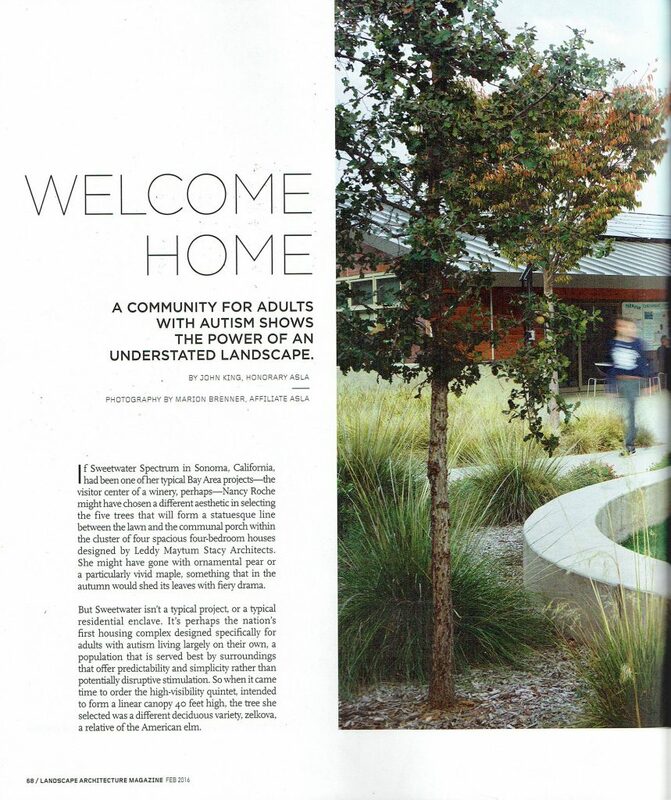 Sweetwater Spectrum www.sweetwaterspectrum.org is an innovative and pioneering new model for meeting the unique everyday living needs of adults with Autism. 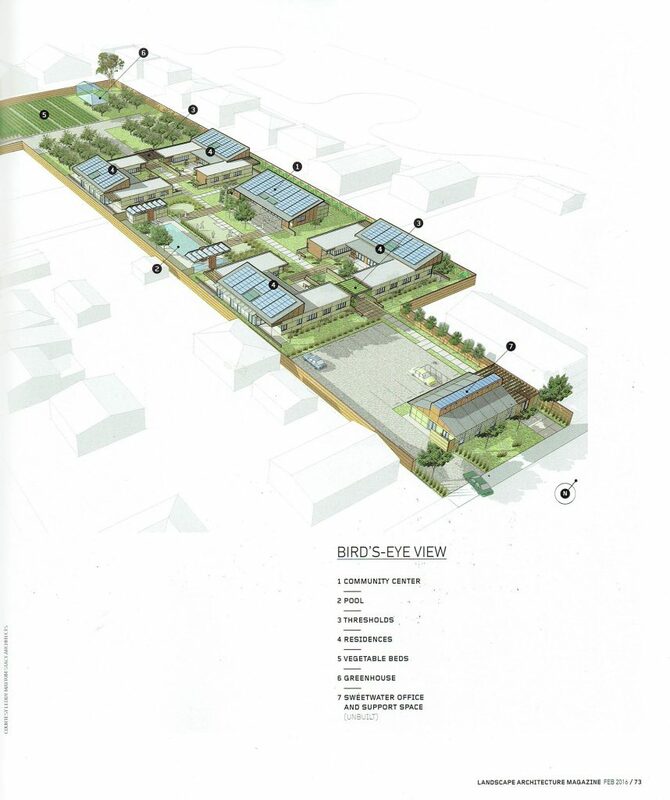 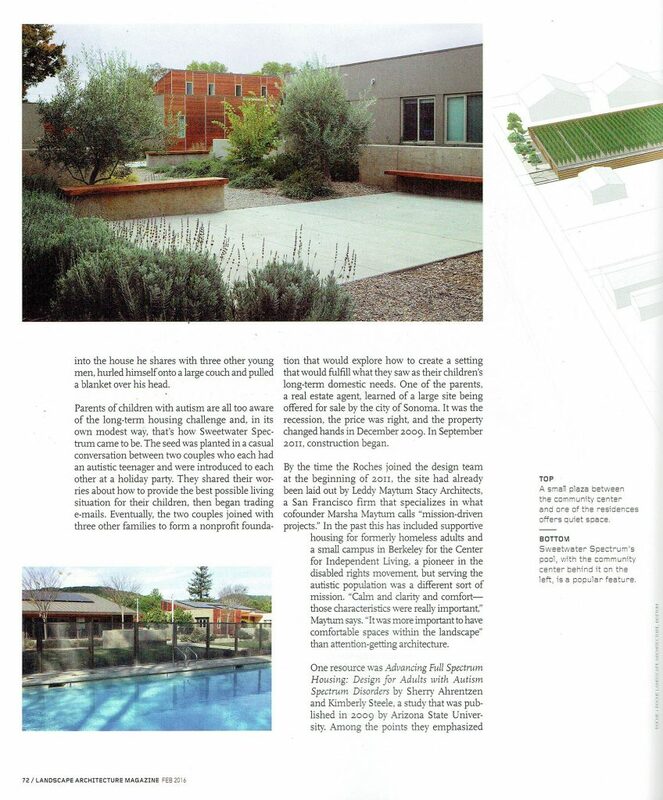 Building on published research and working with the non-profit board of directors, the City of Sonoma, the architect, and other consultants, Roche+Roche fashioned an environment that supported the project’s goal of providing the residents with a ‘life of purpose’. 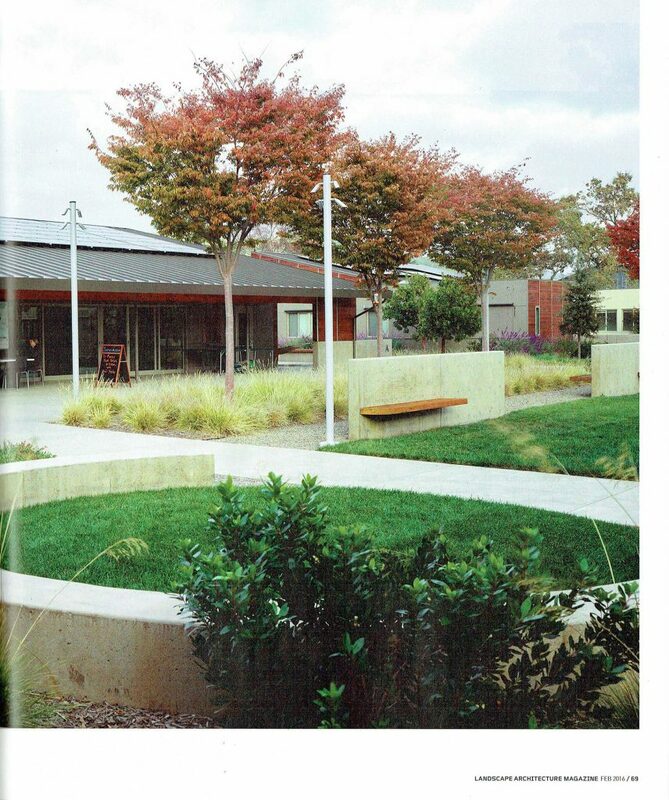 The 2.8 acre campus in the City of Sonoma includes four residences, each with four bedrooms; a Community Center with teaching kitchen, workout studio, library, and a space for art and music; a therapy swimming pool and two spas; pathways, site furnishings, play lawn and plantings, and a 1.25 acre organic vegetable garden and orchard. 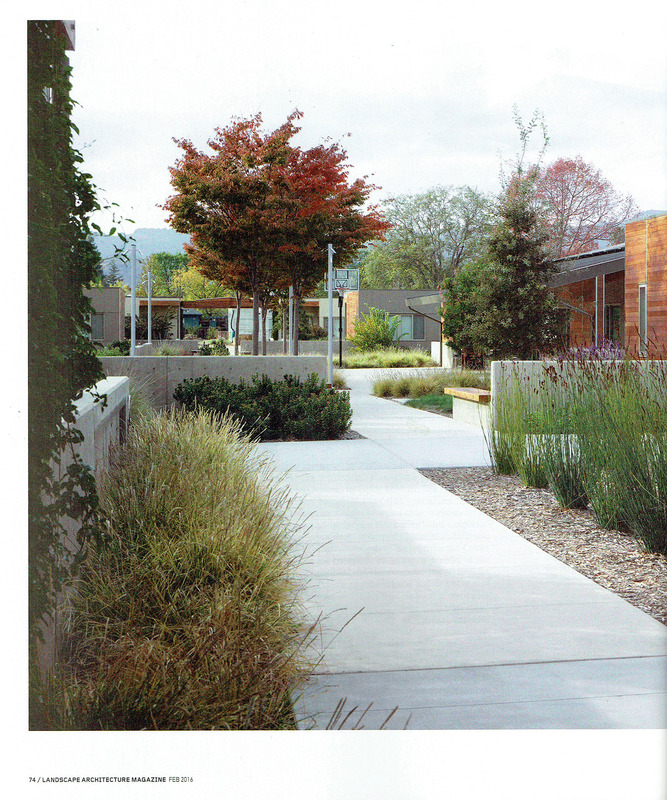 The site, landscape and organic gardens are an integral part of the living, working, learning and social environment for residents, staff and visitors at Sweetwater. 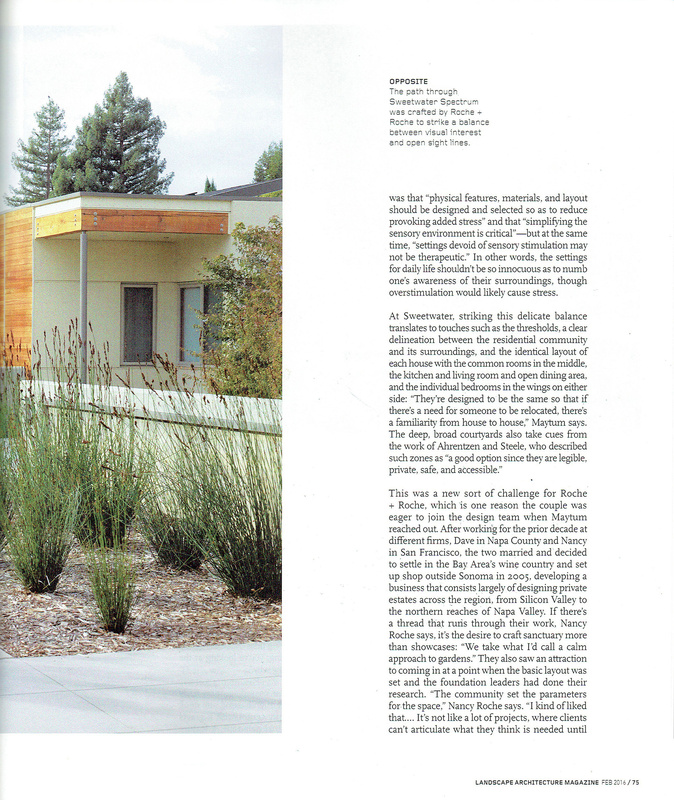 Sweetwater Spectrum has been recognized with an AIA National – Committee on the Environment Top Ten Green Project Award, an AIA National Housing Award, a 2015 ASLA North Coast Chapter General Design Award, and a 2015 ASLA National Residential Design Award.